A Baker’s Bourbon review has been a long time coming, but usually I am too busy drinking Bakers to write about it. In all honesty, when I took my first sip of Bakers bourbon, I was NOT a fan. But after tasting hundreds of bourbons, Bakers has grown on me. Baker’s is part of the Jim Beam Small Batch Bourbon collection that includes Basil Hayden, Booker’s, and Knob Creek. Baker’s is named after the legendary Master Distiller, Baker Beam who was the subject of an oral history project. 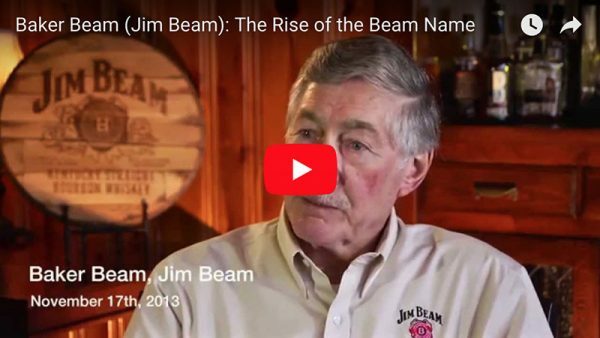 He talks about the rise of the Beam name, and his experience as a distiller back in the early days. There are several short but sweet clips on Youtube featuring the man himself that are worth a listen! Baker’s features the standard Jim Beam bourbon mash bill that includes 76% Corn, 12% Rye, and 10% Malted Barley. FYI: Corn is what gives bourbons sweetness, rye gives is some spice, and barley adds a dry, chocolatey flavor. Jim Beam distillers use the same sour mash process that their ancestors used: some of the mash from the previous batch is added to the next one to maintain consistency across generations of product. While new drinkers may not appreciate all these pleasantries, they all come together to create a true bourbon drinkers whisky. Baker’s is beautiful to behold. Pour a few fingers in a nice tasting glass and take note of the rich burgundy brown color. That’s what 7 years of proper aging will do for you! Its strong rich color is matched by its strong nose. If this is your first time trying Bookers, I suggest you let it open up. Hell, I let every pour open before I jump in. Set your snifter on the table next to you and you will still get aromas like your face was right in the glass! Once my pour opened up, that familiar old wood smell that I love with well aged bourbons made me smile. You can smell every bit of the mash bill coming out of the glass: I smelled the baking spices from the rye, I smelled the ethyl from the proof, I smelled the warm biscuits from the malted barley. Let it open up and you get that sweet corn and caramel that makes your mouth water! The first careful sip will make you see sounds and hear colors. 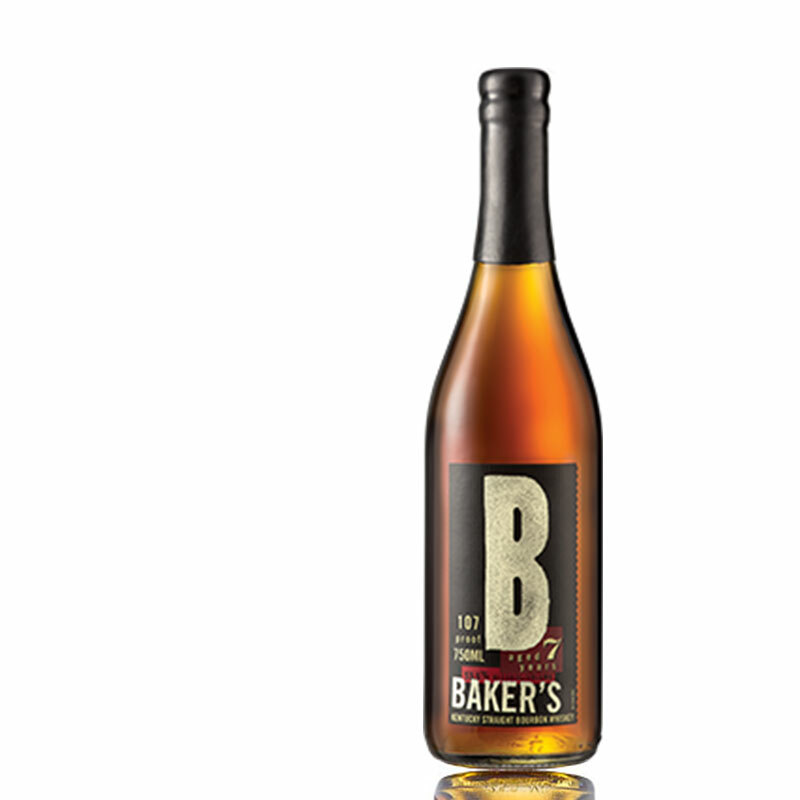 Baker’s is a big-bodied bourbon with a thick texture. If you rush in, Baker’s will smack you and own your sinuses like a Marine Corps gas chamber. But respect the Baker’s, and you are in for one of the better old style bourbons on the market. Love it or hate it, Bakers bourbon is interesting. Sweet and velvety smooth. Rough and dry. Tear jerking and mouth watering. Citrus fruit flavors, pepper, cinnamon, and smoked pecans baby. I was listening to B.B. King while I tasted this and uncontrollably burst into tears. It was that rough. It was that smooth. Every well-traveled bourbon drinker would give Baker’s Bourbon an A- at worst. But for new drinkers, we give Baker’s a B-. I might get tarred and feathered for that grade, but get your chops in order before you take on Baker’s. Have a bottle of Baker’s Bourbon delivered directly to you. Want to leave your own review? Vote using the stars or leave a comment below.